So this is officially “Celebrate Your Name” week. I know this because my hip young friend, Peyton, runs an award-winning marketing firm, and she published a content calendar on her website this week. It’s chock full of things we might not otherwise know. For instance, if you missed out on “World Compliment Day” on March 1, you can still take advantage of “National Napping Day” next Tuesday. And don’t tell my husband (because he’s currently looking at litters online), but March 23 is “National Puppy Day” (which probably means that my coffee table is about to get chewed). When I downloaded Peyton’s calendar and saw the bit about celebrating our names, I thought to myself: That’s kind of freaky. In a freaky good kind of way. Because as timing would have it, I have been thinking a whole lot this week about names. Well, one name, anyway. 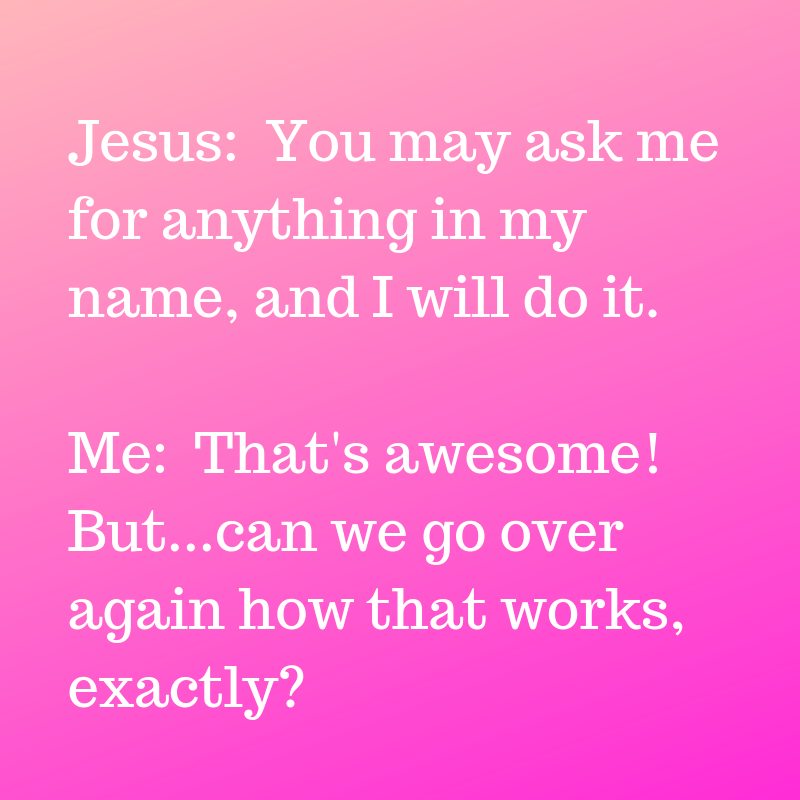 I have been thinking about the name Jesus–and, in particular, how we use it in prayer. Reading verses like these back-to-back, you get the idea that He mean it. Jesus intends for us to know His name–and to use it. Which, for me, raises a couple of questions. I know how I’d feel if I gave somebody the use of my name–like, if I recommended someone for a job, or I wanted to make an introduction. I’d want that person to speak and behave honorably (and not to do anything that might, by virtue of my endorsement, reflect badly on me!). Did Jesus, I wondered, ever have that kind of concern? I wanted to know more about how this “you can use my name” thing really works, and I figured Andrew Murray would have something to say. 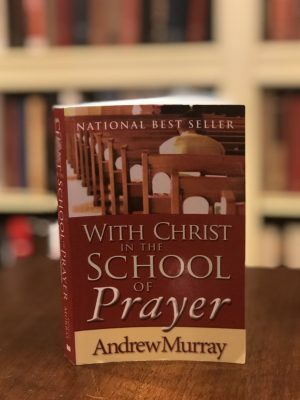 I picked up my copy of With Christ in the School of Prayer (which is getting more dog-eared by the day) and sure enough: He has a whole chapter on this very topic. Not only that, but the power that our prayers carry also depends on our relationship to the Lord. God looks not just to our lips, but also to our lives to see what His name is to us. And as we “walk in the name of the Lord our God” (Micah 4:5), we can effectively pray in the name of the Lord our God–with full confidence that, as Jesus promised, we will receive whatever we ask. And finally (and this goes to my question about the potential for misusing Christ’s name), Murray says that the phrase “in my name” has its own built-in safeguard. When we bear the name “Christian”–living and acting and praying as children of God–the power that’s in the name works. When we try to live (and pray) out from under that power, it doesn’t. Okay. That’s enough Deep Thought for one day. 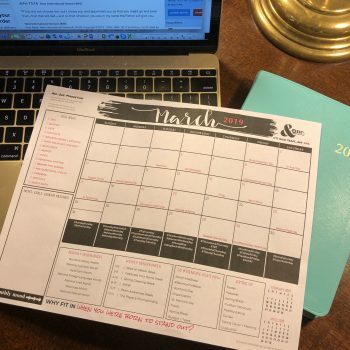 Let’s download our content calendars, thank God for giving us a Name we can celebrate, and look forward to napping next week! Every family, I guess, has its own lexicon. 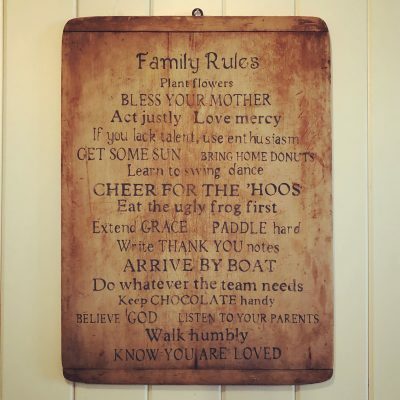 Several years ago, I curated a few favorite Berndt sayings (things like Paddle hard, Eat the ugly frog first, and Keep chocolate handy) and painted them on a “Family Rules” board. Paddle Hard is a take-off on Colossians 3:23, which served as a theme verse for our staycation one year. The Ugly Frog is a twist on Mark Twain (“If it’s your job to eat a frog, it’s best to do it first thing in the morning. And if it’s your job to eat two frogs, it’s best to eat the biggest one first”). And that bit about Chocolate? That’s just basic survival, to us. I love this old board, but there is one rule–one good family rule–that I forgot to include. Hit the ball back began with our son, who views much of life through the lens of athletics. As a fourth-grader, Robbie sometimes forgot to turn in his assignments–until we explained that homework worked exactly like basketball: It didn’t actually count unless you “sunk it” in the teacher’s basket. And then one day, another dad offered to drive Robbie to lacrosse camp. I knew the fellas would be in the car for awhile, and I wanted Robbie’s conversation to sparkle. Trouble was, he had three older sisters, which meant we didn’t actually know whether our boy could talk. It was time for some pregame coaching. I don’t know how the ride went (Robbie thought it was great, but then again, he thought he got all his SAT-Math questions right), but Hit the ball back became a family staple that day. Years later, after our children were grown, I realized that nobody hit the ball back better than Jesus. Whether He served the ball or returned it, the Lord always invited folks to come play. “How many loaves do you have?” Jesus asked, when the disciples wondered where they could find food for 4,000 people. Jesus, of course, knew the answers. He knew how much bread was on hand, that He was God’s Son, and that the blind man wanted to see. So…why all the questions? What was Jesus trying to do? Jesus could have just blurted stuff out (“I am GOD!“), or healed people as He wandered by. Athletically speaking, though, that would be like Roger Federer, playing tennis with me. Federer could serve (or return) the ball 24 times, and the set would be over. 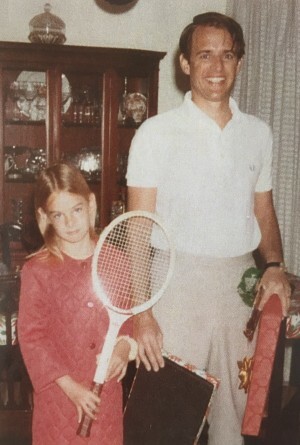 And at the end of the match, I would never have moved from the baseline, my game would be unimproved, and–worst of all–I would not know a single thing about my amazing opponent (other than what I already did, from TV). But that’s not what God wants for our lives. God wants us to move. He wants us to grow. And most of all, He wants us to get to know Jesus. Which only happens when we engage. Jesus didn’t question the disciples for His sake (again, He already knew all the answers), but for theirs. He wanted to draw them into connection, to the place where their lives could be changed. And He still wants to do that today. Just as the disciples offered their loaves, we can give God our resources and talents (meager as they might be), trusting Him to use them to satisfy many. That was Christ’s question to Peter, and He asks the same thing to us. Either He’s God, or He isn’t. What do you say? This last question might be my favorite, because it’s God’s invitation to pray. The blind man probably figured that his need was obvious. When prompted, though, he made his request anyway. Let’s be like him. Let’s not shrink back. Let’s put our needs out there, knowing that we’ve been invited, and let’s hit the ball back when God serves. Thank you, Lord, that we can know You, and that we can ask for Your help. Thank You for Your promise to respond. One of the best things about being a parent is getting to watch your children grow up. That’s also one of the hardest things, particularly when the paths our kids choose don’t line up with our vision for what “their happiness” is supposed to look like, or when we aren’t really sure what God’s best plan is for their lives. It can be easy, during those iffy or uncertain times, to be tempted to give in to fear, or to worry because we aren’t really sure what how to pray. But let’s don’t. Instead, let’s take back that ground with a blessing, releasing our ideas and agendas to God and trusting Him to accomplish his plans in the lives of the people we love. And if you’re in a spot where maybe you don’t love a particular choice your child makes, know this: A blessing is not the same thing as an endorsement. Rather, it’s simply a way of acknowledging God’s sovereignty in our children’s lives and inviting him to shepherd their future. Just a thought. And if you like it, you’ll find a collection of well-loved “scripture blessings” in the Adult Children book. 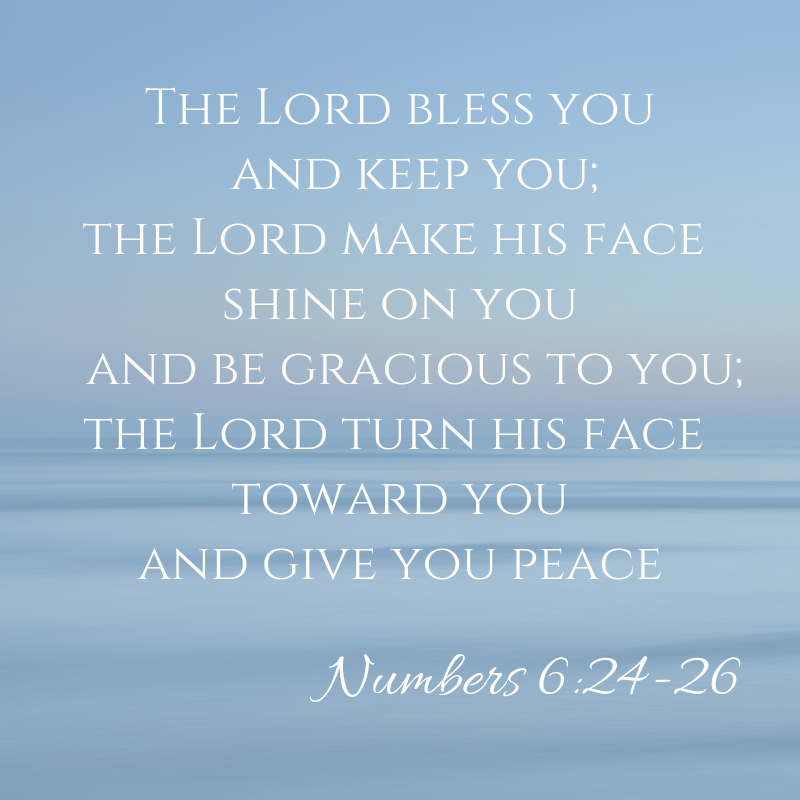 Bless ______ and keep them; make Your face shine on ______ and be gracious to them. I’ve been missing my father this week. His birthday was February 18th; Dad would have been 80 this year. 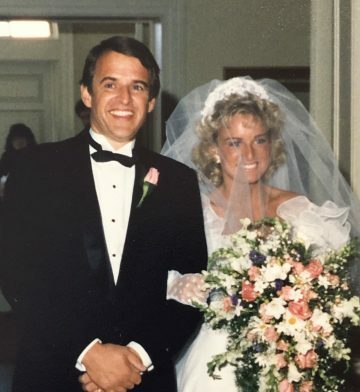 Three years ago, I wrote a post about some of the good gifts Dad gave me (the best being an introduction to Jesus), and I shared a bit about his cancer journey. And this year, as I reflect on his legacy, I’ve been thinking of how many things—physical attributes, as well as interests and skills—fathers pass down to their kids. A classical pianist may teach his children to love Mozart and Bach. A businessman may want to raise up a successor. An athletic dad may urge his kids to play sports. That’s Genesis 1:26. And it comes right before God outlines our destiny. In a nutshell, our original job description was to reproduce, fill the earth, and basically take responsibility to love and care for God’s entire creation. It is a big job. And it would literally be mission impossible, except for two things. The first is the power of redemption. What sin destroyed, God’s grace restored. Thanks to the cross, we are back in the destiny saddle. Put another way, prayer is the conduit through which God’s provision can flow. It is the number one way we can love and care for our world. Because here’s the thing: God could have chosen to work around us, or even in spite of us, but he didn’t. He chose to work in us, and through us, to bless other people. God chose us–us!–to be the channel through which His power is unleashed in our world! All I can think, as I consider our status as “image bearers,” is that it’s because of how much He loves us. Not because we are clever or well-behaved or (thank goodness!) athletic. Our Heavenly Father loves us–and listens to us–just because we are His. So let’s just go ahead and take hold of His Hand. Let’s come before our Father today–the Daddy whose image we bear–and look into his face. I used to write financial planning books. And finally: Time is a tool–and the more you have of it, the better. That last point, the one about time being our ally, also holds true in prayer. Just like extending our time horizon in financial planning can allow the “magic” of compounding to exponentially grow a nest egg, so giving God time to work in response to our prayers releases Him to do more–immeasurably more–than anything we might think we desire. 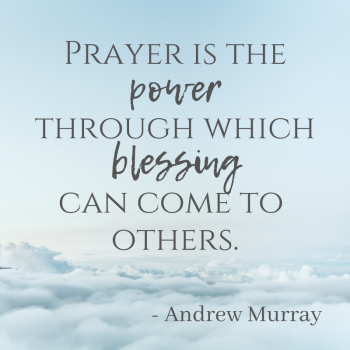 And just like taking the long view in our finances can help us ride the market’s highs and lows without panicking, so adopting a long-term prayer strategy can help us wait well and keep praying–even when the answer seems slow in coming. The toddler who won’t sleep through the night. The teenager battling loneliness. The adult child who has walked away from his faith. The spouse who is looking for work. The sickness–physical or emotional–that just won’t go away. 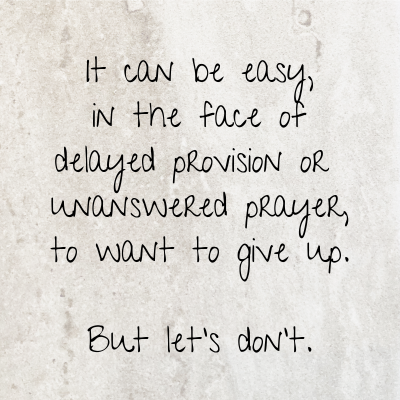 It can be easy, in the face of delayed provision or unanswered prayers, to want to give up. Maybe, we think to ourselves, God has some secret reason for withholding an answer–and the most pious thing we could do would be to just quit. First: God loves us. Lavishly and without condition, even on our worst days. Second: He is all-powerful. It doesn’t matter what our need is; he is able to help. And finally: His timing is perfect. God might be timing things so we learn perseverance. That’s a quality I want my own kids to have; seems like God might want it to shape our lives, too. Sure, I love it when prayer works like a vending machine (request in; answer out), but honestly? The blessings that come after a hard fight or a long wait are the answers I treasure the most. He might be giving us an opportunity to hone our request. Just like earthly parents can get an earful sometimes (one of our kids recently asked for a kitten that comes with its ears folded down, which I gather costs more than some cars), so our Heavenly Father hears all our petitions. Sometimes, though, He has a different idea. (Like, He might want us to get a free cat. Or even no cat.) And when He does, we are wise to follow Christ’s example and pray not just for what we want, but in submission to God’s better plan. Or God could be testing our faith. Not so that He can know how we measure up–He already has that intel–but so that we can. We need to know that we’ve staked our trust in something that’s real, that our confidence is well-placed, and that the ties that bind us to Jesus are strong. God could be doing any number of things while we wait. I don’t know. But let’s not give up. Instead, let’s take the long view, knowing how much He loves us–and recognizing that even though we might not see the whole scope of what God is doing, He makes everything beautiful in its time.